Adults are generally 1/64 – 3/8 inch in length. Their coloring ranges from brown, reddish-brown to black. 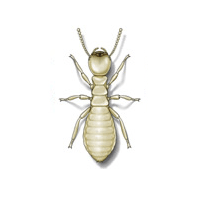 They have short antenna and long cylindrical bodies. They are often brought into structures with unseasoned firewood. They emerge through exit holes and are drawn toward light. 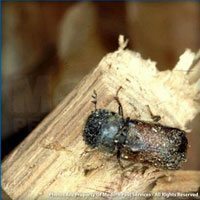 Bark beetles can create problems for log cabins and park shelters when the bark is left on the logs. 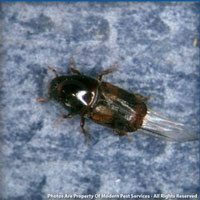 They most commonly infest bark-covered wood. The male or female bore tunnels through the bark, and the eggs are laid in the side niches along the gallery. The larvae will then tunnel its way towards the surface, packing their tunnels tightly with frass. As they molt, the tunnel size increases. They will pupate, near the surface, afterwards, the adult will emerge.